Some may think this is insulting in a down economy, particularly with one of the dogs wearing some kind of necklace. But honestly, though it’s a little tone deaf, I don’t particularly care. I don’t think the dogs are going to eat off those plates. And I don’t think most Americans imagine the interior of the White House looks like a hardware store. Anyway, the whole Marie Antoinette Act, complete with nearly a month of pampering in Hawaii, seems to be working for her. The latest poll from Pew puts Michelle’s favorable rating at 68 percent, with only 24 percent having a negative opinion. Personally, I think it’s hypocritical to present yourself as a warrior for the downtrodden while living so immodestly, especially when so many are feeling downtrodden. But most Americans, clearly, disagree. Maybe the one with the necklace will be Hollande’s dinner partner tonight since he has come stag. Excellent comment ~ wish I’d thought of it! Twitchy had a field day with the ‘family photo op’ and my favorites go to…. So the President’s wife just tweeted photos of her jewelry-festooned canines eating at a mirrored palace table. ooops, didn’t see yours Sadie, posted the link to more Twitchy fun below. Count me firmly in the minority. Along with just about everyone I know here in the real world. Everyone else who said they liked her did it in fear of being called a racist if they said otherwise. 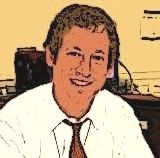 Some fun with that tweet via Twitchy…. Most people give the first lady, any first lady, a break. It’s like getting personal with the children, just not done. I’m not of that camp though. She’s been in our faces since day one. Maybe this is her way of horning in on the Westminster Kennel Dog Show. I suspect there’s more than a touch of naricissism in her psyche. The mutt is pretty blinged out–if you’ve got it, flaunt it. The rest of us will sip our gruel and work hard if we have jobs. It is just the way we are. Just don’t ask sir for more! If a picture is worth a thousand words, then what is this photo tweeted to millions of Americans saying about the O’s and their dogs? Is it saying…look how nice we treat our dogs by allowing them to eat off of a formal table setting? Is it saying…look how lucky our dogs are to be invited to a formal dinner and you’re not? 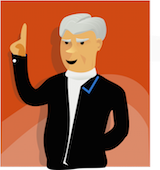 Or is it saying…we can do anything we want and too bad for you? 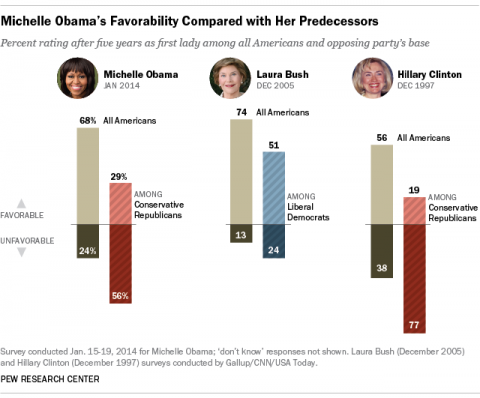 All FirstLadies enjoy high favorable ratings, no matter what their party affiliation. the condition of the economy, and their husband’s actions. Right now, 90+million Americans are out of work, and 50+million are surviving on food stamps and these facts make this insulting tweet all the more hurtful and just downright mean. Now those dogs have breeding! Don’t see any elbows on the table; faces in the plates – shoveling food; uncrossed legs (well, little BO looks like he wants to leap off the chair); or barking for more caviar and champagne. Laura Bush still tops MO in all categories. Probably moreso than the poll reveals. I wonder why anyone would think this tweet is humorous or appropriate? I said this earlier. This — this – is what Mooch learned from Oprah. Yeah girl. You go girl. Celebrate your doggies. Don’t be letting the demands of being First Lady be your master. Grifters — the lot of them. Another faux pas – French meals consist of five courses, not four. They forgot the cheese — or too cheesy to serve cheese? ‘This event highlights the talents of our Nation’s cheese artisans,’ the printed program says. This is inappropriate on so many levels. 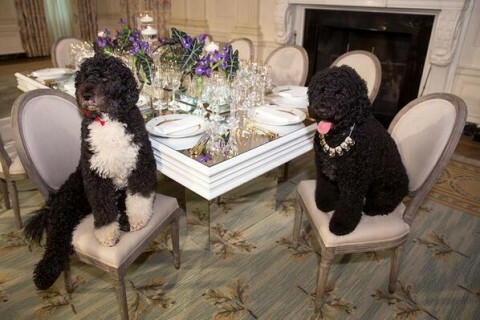 A dog wearing an expensive necklace while sitting on the WH furniture at a table decorated to the NINES. It looks like a table setting from Downtown Abbey. The fact that the dogs are treated like royalty. But then, the current occupants view themselves as royalty, so why not the pets, too. The fact that so many of us are hurting and barely making ends meet in these economic times, in spite of being told by Washington how the economy is improving. Wonder where they live. Oh, DUH–in the richest area of the country. The fact that FLOTUS doesn’t care how the rest of us living. She deserves it as a member of the political class. According to the link I just posted, this is how the tables will be set for the dinner tonight. Hope the guests check their place settings for stray dog hairs. Yuck. Glad Laura Bush had a higher rating – there is some justice. Oh, look… the Obama’s are having the dogs for dinner! Barack is showing Michelle how much he enjoyed the finer aspects of #IndonesianCuisine ! Can’t wait until she announces her bid for the White House! Hillary would howwwwwl! Haven’t seen anyone complaining about “canine inequality”. Oh swell, another photo from Michelle Antoinette, who doesn’t seem to give a damn about perception. Nor does she seem to care the dogs are sitting on OUR furniture. ARRGH!